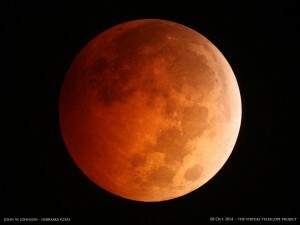 A total lunar eclipse is one of the most dramatic and beautiful – and easiest-to-view – of all astronomical events. During a total lunar eclipse, the sun, Earth and moon form a line in space. Earth’s shadow falls on the face of the moon. An entire hemisphere of Earth can see the eclipse, that is, the whole side of Earth on which it is nighttime when the eclipse takes place. No special equipment needed. Just grab your lawn chair, go outside and plan to spend several hours watching the partial phases of the eclipse, followed by the totality itself, when the moon is completely covered by Earth’s shadow. A total lunar eclipse is one of nature’s grandest spectacles. Follow the links below to learn more. 4. Can you see a selenelion? Be sure you know the right date and time of the eclipse. For example, the eclipse of January 20-21, 2019 begins at 1:07 UTC on September 28. For us in North America, that is Sunday evening – September 27 – at 9:07 p.m. EDT. This same eclipse is visible Monday before dawn for South America, Europe, Africa and parts of Asia. More info and times here. Why are people calling this a Blood Moon eclipse?